Hey all you people who just finished marching this summer! We're running out of Forzato pics! Hurry up and e-mail your best shots from the summer to dave@dci.org along with where and when the photo was taken. Send some biographical information about yourself as well. We'll give you full credit. Also, let us know if you want your e-mail address included. Melissa sent in this one. "This is a picture of me and my best friend Chris Hofius before one of the California shows this year (note the white pants). 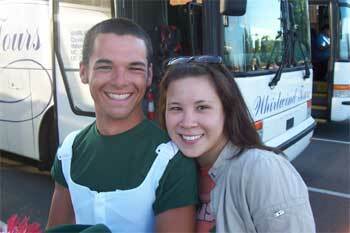 We've known each other since high school marching band, long before his dream of marching with Vanguard was realized. He is now a three-year vet at Santa Clara with one more year to go!"